Chef Richard Azzolini has recently arrived in the San Francisco Bay Area from Manhattan and East Hampton. He is available to help you with your cooking needs. Let me be your private chef for the day. After consulting with you about your culinary preferences, I will custom-design menus that reflect your personal tastes. With my depth of experience I will be able to provide a wide variety of delicious food choices. I am equally skilled at preparing menus with meat and fish as I am with all vegetarian fare. Maximizing the flavors while creating the most healthful food inspires my cooking energies. With meticulous attention to detail and preparation, I am a consummate professional. 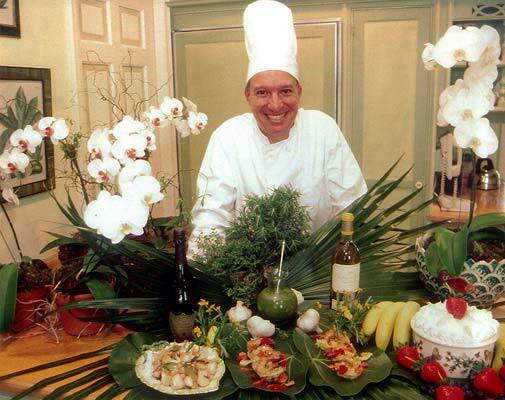 I am a classically trained chef, having studied and worked in Europe, Asia, and America. My food reflects the influences of all three contintents. I have thirty years of experience in preparing gourmet food. My cookbook, There's a Chef in Your Freezer, was published in 2001. Cooking isn't just a job for me—it's a passion. I'm the chef who wakes up at 3am thinking of new fillings for my handmade ravioli. I agree with the philosophy that most of the 'cooking' takes place on the farm. I seek out the very best ingredients for my recipes. Mindful shopping is as important as the cooking. Since every client has different needs, my fee is set once we work out a plan that suits yours. Fees start at $300 per day. I will prepare all the food, leaving you directions on how to heat and serve. I will come to your home, do all the food preparation, clean up, and leave you with a meal ready to serve. A more full services operation: I will come to your home and orchestrate all the food and service requirements for your party. I will do as much or as little as you require and desire. I pride myself in working closely with my clients to insure a fantastic result. Price is based on level of service and menu chosen. Cooking classes can be custom designed to reflect your culinary interests. Classes can be from the basics of cooking to intricate culinary masterpieces. I will provide well written printed recipes for all students. I always recommend doubling the recipes so everyone can take home lots of leftovers. I have a passion for teaching and welcome lots of questions and discussion in my classes. Tell me your culinary dreams and I will help make them a reality. Have you considered having a cooking class dinner party? Get together with a group of friends and cook up a storm. Suggested ideas for cooking class topics. Price is based on class content desired. Please feel free to contact me with any questions you may have about my chef services or cooking classes.